With the current downturn in the housing market many homeowners are looking to remodel their kitchens and bathrooms either for their own enjoyment or for selling their home in the near future. Especially here in Naples where builders once offered only white melamine cabinets and white laminate countertops; they are now offering granite and wood-look cabinets as a standard. This means all the homes and condos that are just a few years old are having a tough time competing with all the incentives builders are offering to unload their inventories. So what is a homeowner to do? When budgets are limited it is always a good idea to incoporate storage aids such as lazy-susan corner cabinets and pull-out trash bins. Bathrooms can also be improved by adding linen cabinets. According to a recent survey they are the number one requested item and are sure to help improve the value of your remodel. I always suggest my clients look at a 5-piece glazed thermofoil door. It’s similar to what the builders offer but it looks like a glaze has been applied. The glazing makes these cabinets look more expensive than they really are – a great selling bonus. 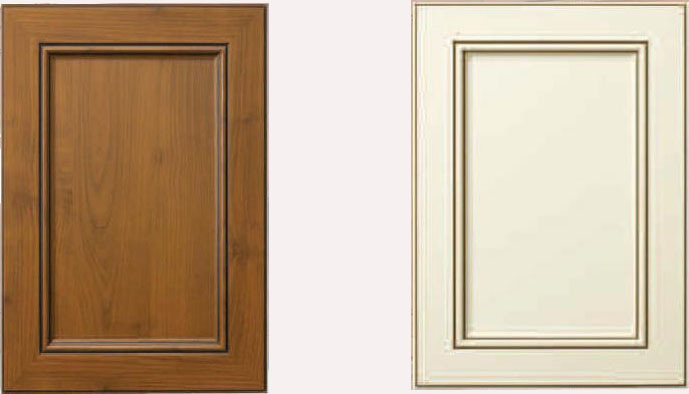 Here’s a picture showing two of the 4 finishes available through Kitchen Studio of Naples, Inc.
terrific blog and info. You’re in my bookmarks!